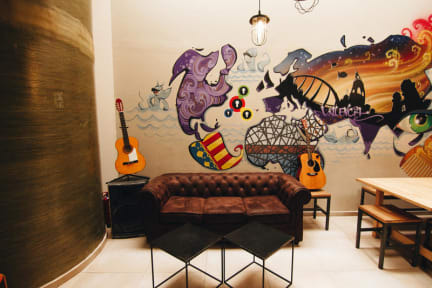 Purple Nest Hostel Valencia i Valencia, Spanien : Boka nu! Everyone who worked there were super friendly. I would definitely stay here again. The bathrooms were well maintained and pretty clean for having so many guests. The room was a little hot but not much you can do bout that and we were never in the room other than for sleeping. Stayed off season so cheap, great atmosphere, safe, and great location. Great atmosphere and organized several activities which made it easy to connect. Nice bar downstairs and a rooftop upstairs. Simple beds and no socket near my bed but facilities in general were good and clean. Nice hostel with very nice and helpful staff! The hostel was good, a typical hostel basically! Not bad or not to good but it’s one person that make my stay and it was was Jess from my “Tour me out” who gave me a beautiful tour around the city and made me feel home in Valencia.